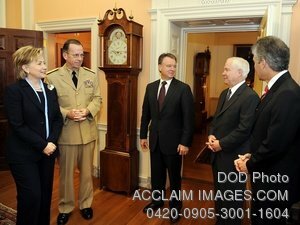 Description: Stock photo of Secretary of State Hillary Clinton talking with Chairman of the Joint Chiefs of Staff Adm. Michael Mullen, Australian Minister for Defense Joel Fitzgibbon, Secretary of Defense Robert M. Gates and Australian Minister for Foreign Affairs Stephen Smith at the U.S. Department of State building in Washington, D.C., April 9, 2009. (DoD photo by Master Sgt. Jerry Morrison, Air Force). Stock photography by Department of Defense Public Domain.